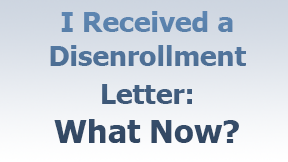 I Received a Disenrollment Letter: What Now? A little history first, Medicare advantage (MA) plans were ramped up in 2006 as authorized by the 2003 Medicare Modernization Act passed during the Bush administration. Several insurance companies jumped into the fray offering their own version of MA plans. In 2010 we began to see a “shaking out” with companies withdrawing their plans from certain markets. There was also some Congressional legislation that helped prompt this. The question is, what are my choices if I receive a non-renewal/disenrollment notice this fall from my MA company? Obviously, the subject at hand does not affect Medicare supplement (Medsupp) policyholders. It also does not affect all MA plan members, it only affects some, and it certainly will affect many people in Montana. The states of Idaho, Oregon, and Washington have already gone through much of their “shaking out” and adjustments, so things have generally settled down in those states for the time being. Wyoming has already gone through this process with most counties no longer having any MA plans available. The first part of your non-renewal notice states that your MA company is non-renewing your plan for 2018. It will have the usual verbiage about “changes in the marketplace, etc., etc.” The bottom line is that the insurance company is losing money in a given market and has to make some changes. Again, the causes for this are explored in our companion article, Medicare Advantage Funding and the Causes of Non-Renewal Notices. Important! Be sure to save your notice. You may need it! Your non-renewal notice further on down will get into the nitty-gritty and lay out your options. Let’s say you have Company Green, and they have sent you your non-renewal notice. If Company Green is offering a new MA plan that is substantially different from your current plan with them, you can enroll in that new plan. This will require a new The premium and/or copays likely will be higher compared to your current plan. Your non-renewal notice also will list other MA plans that may be available in your county of residence. What adds to the confusion of these multi-page notices is that at least based on previous years, they also list some of the stand-along prescription drug plans (PDPs) that are available in your state. Put another way, those notices can throw too much information at you.If Company Red offers their MA plan in your county, that is another choice. To add to the mix, a new company may have decided to enter the marketplace. For example, Company Purple is coming to Yellowstone County (Billings, Montana) in 2018. Your non-renewal notice will also explain your guarantee issue rights for Medsupp plans A, B, C, F, K, and L. Be sure to save your non-renewal notice as we must attach a copy (the first page) with your Medsupp application as proof that you qualify for a guarantee issue Medsupp if you opt for this choice. What is meant by Guarantee Issue? Guarantee issue (GI) means just that; your acceptance is guaranteed and you cannot be declined. Even if you have a health condition that the Medsupp company would normally decline, your issue is guaranteed. Medicare has established these rules to ensure that no one gets dumped without the opportunity to get a Medsupp plan. Example #1: John Doe had a stroke six months ago. Most Medsupp companies ask if you have had a stroke or TIA’s (mini-strokes) in the last two years and will decline your application if you have had one. With the GI rules, the health questions are waived, and John Doe can sign up for one of the six lettered plans as described above. As long as we attach a copy of the first page of his non-renewal notice to his application, the Medsupp company has to issue his policy. Example #2: Jane Doe is on kidney dialysis. She has run up considerable copays on her MA plan and would have thousands more out-of-pocket with another MA plan. She uses the guarantee issue rules and signs up for Medsupp Plan F. Depending on her age, her premium might run anywhere from $150 to $235 per month. Again, the company cannot decline her application as long as we attach a copy of her non-renewal notice to her application. Why would I want to pay for a higher Medsupp premium if I can get a lower priced MA plan? As mentioned in Example #2, there are occasions when a more expensive Medsupp plan can cost you less than an MA plan. All MA plans have what’s called the Maximum-Out-Of-Pocket limit or MOOP. The legal maximum set by Medicare is $6,700. An MA company, at its discretion, may offer a lower MOOP. Let’s say that Jane Doe has Company Black’s MA plan. Their MOOP is $5,500 and their premium is $70 per month. With her dialysis treatments, she pays 20% of the dialysis costs until she hits her MOOP. Then the insurance company pays 100% after that for the remainder of the year. Let’s say she hit her MOOP in September. Here are Jane’s projected annual costs. Compare the above with a Medsupp Plan F for $235 per month. She needs to pick up a stand-alone Prescription Drug Plan (PDP), so let’s say she gets a $32 per month plan. $32 x 12 months = $384. $2,820 + $384 = $3,204. This is much less than the $6,240 figure for her MA plan. If you have medical issues that can cause a lot of copays with your MA plan, then going with a Medsupp, as in Jane’s case, could cost you much less in the long run, despite the higher Medsupp premium. Sign up with a new MA plan from your same company, if available. Sign up for a plan with another MA company. Take advantage of your guarantee issue (GI) right and sign up for a Medsupp Plan A, B, C, F, K, or L. Note: Most people will choose Plan F because it is the most complete plan of the six choices. If you are on a budget or don’t have many medical issues, Plans K and L are worth a good look. Plan K has the lowest premium and also the most out-of-pocket costs. Plan L may be a very worthwhile solution for some people. Also note that Plans G and N are NOT eligible for GI. Exception: There is one company that offers their Plans G and N for guarantee issue. Here are some criteria that may assist people in deciding which way they want to go. You are in good to excellent health and do little or no doctoring. Therefore, your copays will likely be minimal. The lower premium for an MA plan fits your budget. Your MA plan has a unique feature or benefit such as a health club membership, a vision or dental benefit, or an unusually low copay for a particular prescription. Remember, most of these MA plans also include a prescription plan. The Medsupp’s higher premium is worth it so you won’t have to deal with the MA copays. Your prescription costs will be less by shopping for a stand-alone PDP. (Remember, no Medsupp plan includes prescriptions, so you’ll likely want to sign up for a stand-alone PDP. This is the second or third time you have received an MA non-renewal notice and are tired of the merry-go-round. You want peace of mind. Your needs have changed. For example, you are traveling more and more out-of-state and would prefer not to be in a networked MA plan. Despite the copay responsibility that goes along with Plan K and L, you realize that these two plans may have lower out-of-pocket expense compared to an MA plan. This is especially true with the MA premiums taking some substantial increases. Sign up for Medsupp Plans G or N, which are NOT guarantee issue. Your health is stable, and you want to sign up for the lower premium Plan G or N. You will have to have all “NO’s” to the health questions on the application. In general, if your health has been stable for the past two years, you likely will meet the underwriting requirements of most companies and medically qualify for either Plan G or N. Please keep in mind that the health requirements will vary from company to company. Let’s say that you would like to apply for a Plan G or N, but you have a health condition that will cause your application to be declined. Earlier we referenced one company that DOES offer Plan G and N on a guarantee issue basis. Their premiums are somewhat higher compared to other companies, but at least they will accept your application on a GI basis. This could be a good strategy to sign up for a GI Medicare supplement but at a lower premium compared to Plan F.
Choosing the right prescription drug plan. Remember, no Medsupp plan covers your meds, so we’ll shop on Medicare.gov for a cost-effective PDP for your situation. You can make your change during the October 15 through December 7 Annual Election Period (AEP). In addition, Medicare gives you a Special Election Period (SEP) that runs December 8 through February 14, 2018. We offer almost all of the available Medicare advantage or Medicare supplement plans in our market, so we’ll definitely appreciate you staying with us. You won’t have to deal with seminars, calling other companies, shopping for a new agent, sifting through countless offers in the mail, or being overly stressed from confusing TV advertising. For those receiving a non-renewal notice from their Medicare advantage company, we’ll be calling you. (Note: If you have recently changed your phone number, please call us.) We can’t get to everyone at once, so we thank you in advance for your patience. We will walk you through your options to arrive at the most suitable choice for your situation. We have worked hard to earn your business, and we will continue to do so. To help give you a better understanding of why MA companies withdraw their plans from the market place, please refer to our companion article, Medicare Advantage Funding and the Causes of Non-Renewal Notices.